A PJ book? Are we talking about a new Pajamas book? A rising Photo Journalist? 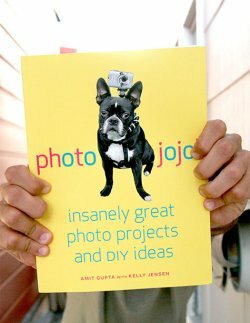 Our friends over at Photojojo lunched the Photojojo book. It is a book loaded with great projects for the DIY addict. For a long time now, I’ve been reading the PJ newsletter. It is a great source to get project inspiration and some great ideas to lay with once you are sitting at home wondering what to do with all those great pictures you took. Now I am really glad they got some of the projects down to paper form. Something that will last long after the last bit of the internet will die. The book features some of PJ’s great projects and some really great new ones. The DIY Bottlecap tripod, a cool camera dog mount and an SLR pinhole camera are some of the great gear projects (kinda like the stuff you’ll find on DIYP, so if you’re reading this on DIYP, which you are, there is a good chance you’ll like this book). The photo messenger bag, Photo laptop sleeve and Photo Rubik’s Cube are three of the great projects to do once you already have those pictures. Learn more about the book at the PJ official announcement.